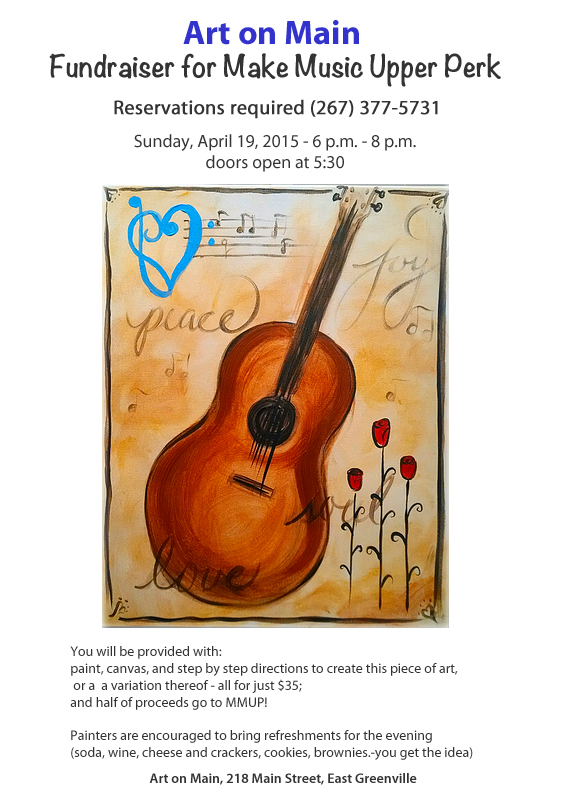 The wonderful folks at Art on Main created this painting especially to celebrate Make Music Upper Perk, and have generously set aside the evening of Sunday, April 19, 2015 to offer a fundraiser event for the music festival where you can create your own version of this piece of art. And don’t worry if you have never picked up a paintbrush before; everyone will be given step by step directions and personal support and help throughout the evening (along with the paint and canvas). One can show up a little before 6 p.m. prepared just to paint (and have a sociable night out with friends and neighbors) or bring with you some refreshments; a light supper, sweets, whatever you like, to enjoy before and during the painting session. Art on Main will supply glasses (and bottle openers for wine and other beverages, as needed), along with painting supplies and an art smock to protect your clothes. Bring a friend, a spouse, a sister or brother,…or just bring yourself. Call Art on Main with any questions, and to reserve your spot sooner rather than later, because space is limited and filling up fast: 267-377-5731. Art on Main is located in East Greenville at 218 Main Street. This entry was posted in Make Music Upper Perk, weekend highlights, workshops. Bookmark the permalink.